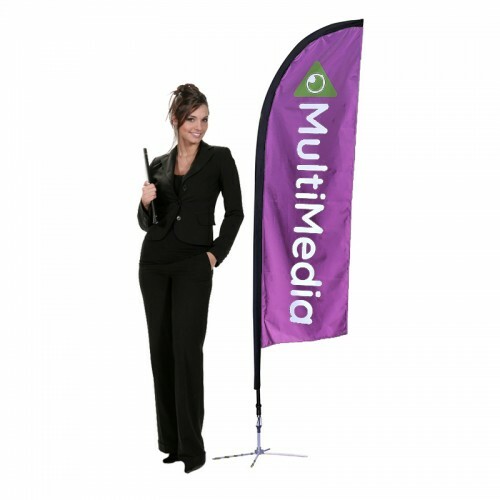 Flying flags attract attention and bring traffic inside your store or business! About Flag Graphics: We print your custom flag on a polyester mesh material that allows good air to flow. The flag graphic includes a black trim which it is sewn on the edge of the graphic (pole-side), leaving a pocket for pole insertion. The flags are printed with dye sublimation. Our inks heavily saturate the material to create a 95% bleed through for single sided flags, the back side reads reverse. For double sided flags we print two (2) separate flags, and we place silver-gray blocker material in the middle. Shipping Dimensions: 4" x 4" x 48"
Single Sided: Image is printed on one side of the banner the back side shows up to 95% reverse image of the front side. Water Bag for Cross Base Flag Stand *** WARRANTY *** Lifetime Warranty on Hardware Water bags..
Water Base for Teardrop Flag, Feather Flag and Mamba Flag Banners*** WARRANTY *** Lifetime Warrant..
Falcon Flag Mount 0 Degrees for Popup Canopy TentsFalcon feather flag mounts are great for displayin..
Trade Show Display 32in Wide Standing Retractable Banner Pacific 800 The Pacific roll up banner ..